#50. Kanye West f/ Chris Martin "Homecoming"
Kanye West f/ John Legend "Home"
Kanye West f/ Chris Martin "Homecoming"
If you were on the Kanye train (ayo?) early on, then you heard the first incarnation of "Homecoming" on the Get Well Soon mixtape. The O.G. version of "Home" featured a then-unknown John Legend (er, Stephens at the time) and a completely different beat altogether. The extended metaphor for Yeezy's hometown centers around "Wendy" (as in Windy City—get it?) and captures Kanye's bittersweet relationship with the place he calls home. 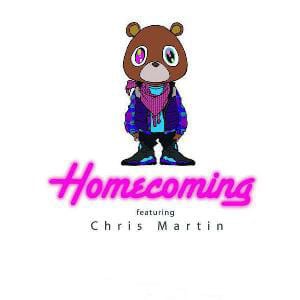 Five years later he recruited Chris Martin of Coldplay to re-record the song during a jam session at Abbey Road Studios in the U.K. "Homecoming" was finally properly released in 2007 on Kanye's third album, Graduation. The incredibly dope Hype Williams–directed video features shots of various landmarks in Chicago (Millennium Park, the Cabrini Green projects, Sears Tower), as well other hip-hop artists (Common, L.E.P. Bogus Boys).